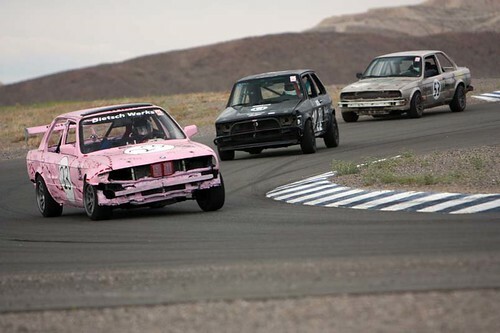 An E30 becomes a LeMons Legend? 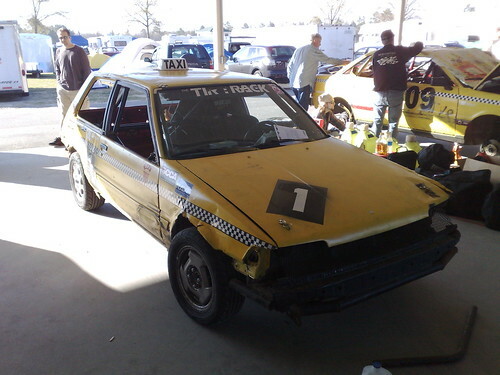 In this case, you’re looking at one of the all-time legendary LeMons cars. Notice how every body panel seems to have been hit hard, repeatedly? 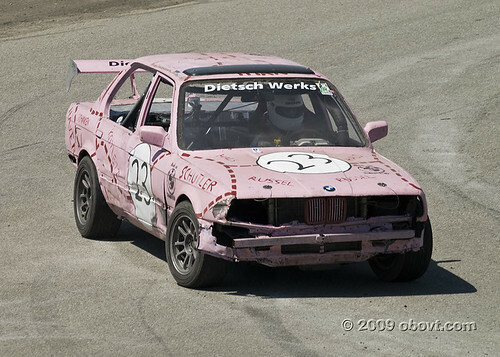 That’s because this car is a veteran of the early races at Altamont, including the notorious “Demolition Derby” race of October ’07 and the not-much-less-brutal May ’08 race. 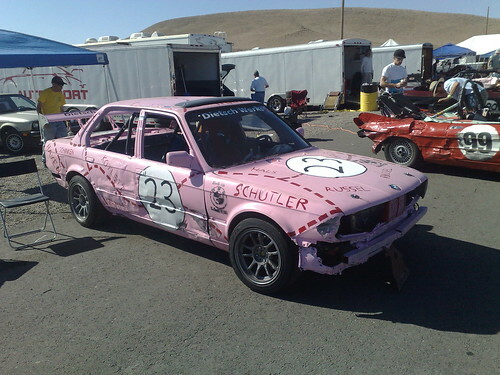 With seven LeMons races to its credit, the Formula BMW E30 has finished 44th, 44th, 20th, 10th, 5th, 10th, and 6th during its career… and been hit approximately 8,000 times (7,997 of those at Altamont). 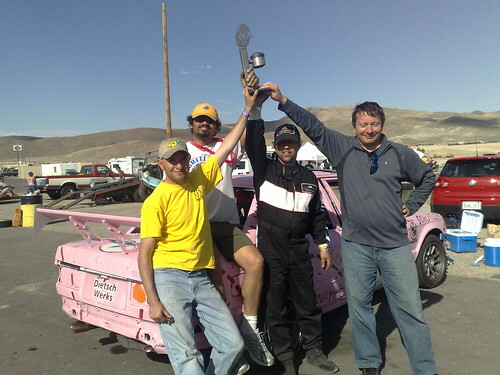 Running its first competitive race after 28 years, the Porsche 917/20 “Pink Pig” made a triumphant return to endurance racing at the Reno event of 24 Hours of Lemons vintage racing series. A lack of power at altitude combined with niggling fuel and wheels meant that the car could not compete on outright pace and instead had to depend on strategy to make its way up the field. Ultimately the Formula BMW team fell just short and had to settle for a class win and 5th overall instead of the overall victory they were aiming for. In case any of you haven’t figured out already, my last post was a fake press release. 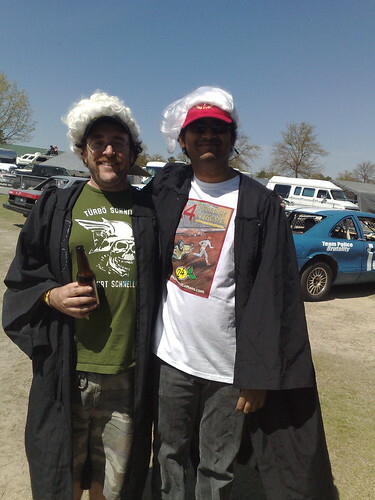 It was actually our teams entry form into the next 24 Hours of Lemons race where we will be sporting the “Pink Pig” livery of the Porsche 917/20. I am happy to say that the organizers liked our idea and we have officially been accepted in the Reno event to be held at Reno-Fernley raceway on May 23-24. Now we just need to get the lemon ready in time. In order to celebrate the 40th anniversary of the Porsche 917, Zuffenhausen has restored one of their most famous vintage race cars for one final race. The “Truffle-Hunter from Zuffenhausen” a.k.a. 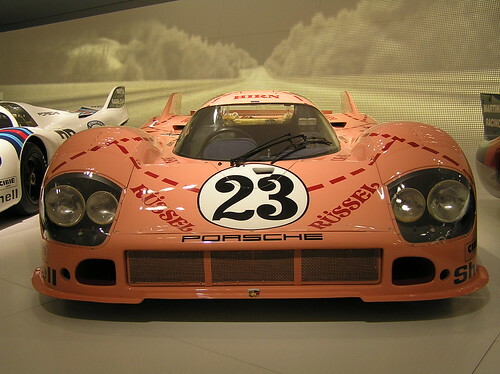 the Porsche 917/20 will take one last shot at glory by entering the 24 Hours of Lemons before being permanently enshrined in the new Porsche Museum.